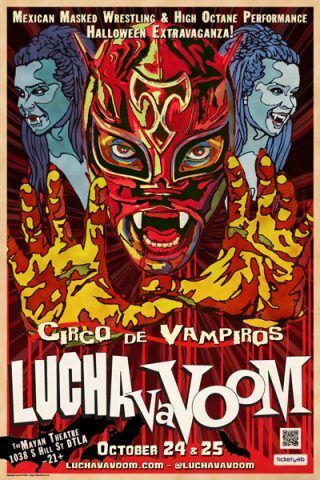 Don’t Miss Lucha Vavoom’s Circo de Vampiros this Wednesday! It’s almost time for Lucha VaVOOM’s Circo de Vampiros! What could be better than Mexican wrestling? Or burlesque? How about both! Lucha VaVOOM has made a name for themselves with this genius mash-up. And this year they are adding vampires! 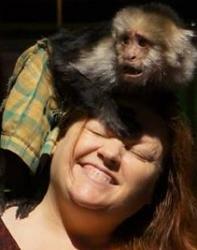 And a circus! What more could anyone ask for? Performers include the bionic Viktoria Modesta, the debut of Miss Mosh, The Poubelle Twins, aerial daredevil Kate Minwegan and more! Lucha Libre wrestlers from Tijuana, Juarez, and locals from right here in Los Angeles, including Crazy Chickens and Dr. Maldad! Plus comedy, music and more! Wear a costume to participate in the annual costume contest! Sadly, Thursday is already sold out. Do not miss your chance to get the good tix for tomorrow!!! Doors at 7:00. The show starts at 8:00 PM at The Mayan in DTLA. General Admission is $40. There are plenty of pay parking lots on/near Olympic & Hill. This entry was posted in Attractions, News & Sports, Theater, Upcoming Events and tagged burlesque, Circo de Vampiros, Dr. Maldad, Kate Minwegan, Lucha Libre, Lucha VaVoom, Mexican wrestling, Miss Mosh, The Mayan, The Poubelle Twins, Viktoria Modesta. Bookmark the permalink.